Samuel Cook (January 22, 1931 – December 11, 1964), known professionally as Sam Cooke, was an American singer, songwriter, civil rights activist and entrepreneur. Influential as both a singer and composer, he is commonly known as the King of Soul for his distinctive vocals and importance within popular music. He began singing as a child and joined The Soul Stirrers before moving to a solo career where he scored a string of hit songs like "You Send Me", "A Change Is Gonna Come", "Wonderful World", "Chain Gang", "Twistin' the Night Away", and "Bring it on Home to Me". Two singles and an album were released in the month after his death. One of the singles, "Shake", reached the top ten of both the pop and R&B charts. The B-side, "A Change Is Gonna Come", is considered a classic protest song from the era of the Civil Rights Movement . It was a top 40 pop hit and a top 10 R&B hit. The album, also titled Shake, reached the number one spot for R&B albums. After Cooke's death, his widow, Barbara, married Bobby Womack. Cooke's daughter, Linda, later married Womack's brother, Cecil. 1 2 "Jesus Gave Me Water". Songsofsamcooke.com. March 1, 1951. Archived from the original on February 16, 2013. Retrieved February 13, 2013. 1 2 David Ritz. "Sam Cooke". Encyclopædia Britannica. Retrieved September 28, 2008. ↑ Janovitz, Bill. "Cupid - Sam Cooke". AllMusic. Retrieved September 5, 2014. ↑ Appiah, Kwame Anthony; Gates, Henry Louis, Jr., eds. (2004). Africana: An A-to-Z Reference of Writers, Musicians, and Artists of the African American Experience. Running Press. p. 146. ISBN 0-7624-2042-1. ↑ DeCurtis, Anthony; Henke, James (1992). The Rolling Stone Illustrated History of Rock & Roll: The Definitive History of the Most Important Artists and their Music. Random House. p. 135. ISBN 0-679-73728-6. ↑ Nite, Norm N. (1992). Rock On Almanac: The First Four Decades of Rock 'n' Roll: A Chronolology. New York: HarperPerennial. pp. 140–142. ISBN 0-06-273157-2. ↑ Eder, Bruce. "Sam Cooke: Biography". AllMusic. Retrieved September 2, 2014. 1 2 3 Bronson, Fred (2003). The Billboard Book of Number 1 Hits: The Inside Story Behind Every Number One Single on Billboard's Hot 100 from 1955 to the Present. Billboard Books. p. 30. ISBN 0-8230-7677-6. ↑ Guralnick, Peter (2005). Dream Boogie: The Triumph of Sam Cooke. Little, Brown and Company. p. 9. ISBN 0-316-37794-5. ↑ Guralnick 2005, pp. 9–10, 17. ↑ Guralnick 2005, p. 10. ↑ Guralnick 2005, p. 15. ↑ Guralnick 2005, p. 22. ↑ Guralnick 2005, pp. 13-14. ↑ Guralnick 2005, pp. 29–31. ↑ Guralnick 2005, p. 90. ↑ Guralnick 2005, pp. 65-68. ↑ Guralnick 2005, p. 47. ↑ Eder, Bruce. "Sam Cooke AllMusic". Retrieved 2017-08-21. ↑ Guralnick, Peter (September 22, 2005). "The Man Who Invented Soul". Rolling Stone. Archived from the original on February 6, 2009. Retrieved August 8, 2008. 1 2 "Show 17 - The Soul Reformation: More on the evolution of rhythm and blues". Pop Chronicles. Digital Library, University of North Texas. June 22, 1969. Retrieved September 22, 2010. ↑ Guralnick 2005, pp. 171–180. ↑ Guralnick 2005, p. 167. ↑ "Sam Cooke". Rock & Roll Hall of Fame. Retrieved 2017-10-10. ↑ Dean, Maury (2003). Rock 'N' Roll Gold Rush: A Singles Un-cyclopedia. Algora Publishing. p. 176. ISBN 0-87586-207-1. 1 2 Warner, Jay; Jones, Quincy (2006). On This Day in Black Music History. Hal Leonard Corporation. p. 10. ISBN 0-634-09926-4. ↑ Goodman, Fred (2015). Allen Klein: The Man Who Bailed Out the Beatles, Made the Stones, and Transformed Rock & Roll. Houghton Mifflin Harcourt. p. 40. ISBN 978-0-547-89686-1. ↑ Guralnick 2005, pp. 308, 311, 324. ↑ Guralnick 2005, p. 338. ↑ Guralnick 2005, pp. 348, 361. ↑ Guralnick 2005, p. 362. ↑ Guralnick 2005, pp. 404–407. ↑ Guralnick 2005, p. 460. ↑ Guralnick 2005, pp. 390, 396. ↑ "Sam Cooke - Billboard Charts". 2019 Billboard. Retrieved 2019-01-03. ↑ Goodman 2015, pp. 44–46. ↑ Krajicek, David. "The Death of Sam Cooke". CrimeLibrary.com. Archived from the original on February 10, 2015. Retrieved September 9, 2016. ↑ "Singer Sam Cooke Shot To Death". Jet. December 24, 1964. pp. 62–63. ↑ Goodman 2015, p. 57. 1 2 Wolff, Daniel (1995). You Send Me: The Life and Times of Sam Cooke. New York: William Morrow. ISBN 0-688-12403-8. ↑ Guralnick 2005, pp. 619, 628. ↑ Guralnick 2005, p. 619. ↑ Guralnick 2005, pp. 619, 627. ↑ Guralnick 2005, pp. 616–619. ↑ Guralnick 2005, p. 643. ↑ United Press International (December 16, 1964). "Shooting of Sam Cooke Held 'Justifiable Homicide'". The New York Times. ↑ Robinson, Louie (December 31, 1964). "Death Shocks Singer's Fans". Jet. pp. 59–64. ↑ Guralnick 2005, pp. 626–629. ↑ Milicia, Joe (December 6, 2005). "Sam Cooke's story told from 'the inside out'—A thorough effort to give him his due". Archived from the original on November 5, 2012. Associated Press: "That he was killed after being scammed by a prostitute just didn't make sense to many people. It's an end that his sister, Agnes Cooke-Hoskins, still discounts. 'My brother was first class all the way. He would not check into a $3-a-night motel; that wasn't his style,' she said while attending a recent tribute to Cooke at the Rock and Roll Hall of Fame and Museum." ↑ Greene, Erik (2006). Our Uncle Sam: The Sam Cooke Story from His Family's Perspective. Trafford Publishing. ISBN 1-4122-0987-0. ↑ James, Gary, "Interview with Solomon Burke" (January 27, 1992), Classic Bands: "I've always felt there was some sort of conspiracy there. ... I listened to the reports and I listened to the story of what happened and I can imagine Sam going after his pants. I can imagine Sam going up to the counter and saying 'Hey, somebody just took my pants.' And he's standing there, seeing the woman with his pants. I can imagine him saying "Give me my pants." But I can't imagine him attacking her. He wasn't that type of person to attack somebody. That wasn't his bag. He was a lover, OK. He wasn't a fighter. He wasn't a boxer. You never heard of Sam Cooke beating up his women." ↑ Guralnick 2005, pp. 642-643. 1 2 Gordon, Ed (November 16, 2005). "'Dream Boogie': The Life and Death of Sam Cooke". National Public Radio. Interview with Peter Guralnick: "...I would say within the community there is not a single person that believes that Sam Cooke died as he is said to have died: killed by a motel owner at a cheap motel in Los Angeles called the Hacienda which he had gone to with a prostitute named Elisa Boyer. I could have filled a hundred pages of the book with an appendix on all the theories about his death. Central tenet of every one of those theories is that this was a case of another proud black man brought down by the white establishment who simply didn't want to see him grow any bigger. I looked into this very carefully. I had access to the private investigators' report, which nobody had seen and which filled in a good many more details. And no evidence has ever been adduced to prove any of these theories." 1 2 Hildebrand, Lee (April 10, 2007). "Elvis biographer Peter Guralnick tackles another music legend: Sam Cooke". San Francisco Bay Guardian. ↑ Drozdowski, Ted (March 14–21, 2002). "Soul man, Sam Cooke's fulfilling late period". Boston Phoenix. Archived from the original on 2006-05-28. Retrieved 2006-05-19. "It's hard to buy into conspiracy theories, though several swirl around this incident that paint Cooke as the victim of a plot by white supremacists to silence the country's most popular self-empowered black man." ↑ James, Etta; Ritz, David (2003). Rage To Survive: The Etta James Story. Da Capo Press. p. 151. ISBN 0-306-81262-2. ↑ Goodman 2015, pp. 57–58. 1 2 3 4 5 Robinson, Louie (February 1965). 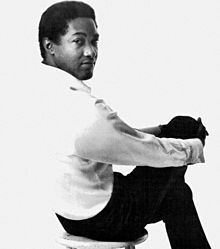 The Tragic Death of Sam Cooke. Ebony. pp. 92–96. Retrieved 2013-12-21. ↑ Robert Fontenot. "Today in Oldies Music History: December 18". about.com. Archived from the original on 2015-09-06. Retrieved 2015-08-31. ↑ "Crowd at Sam Cooke's Funeral". Corbis Images. Retrieved 2015-08-31. ↑ "Sam Cooke's Swan Song of Protest". npr.org. Retrieved 2008-08-08. 1 2 "Cooke's killer sues his estate". Washington Afro-American. April 6, 1965. p. 1. ↑ "Will Sam Cooke's widow appeal?". The Afro-American. June 10, 1967. p. 10. ↑ Guralnick 2005, pp. 101,105. ↑ Guralnick 2005, p. 282. ↑ Guralnick 2005, p. 243. ↑ Guralnick 2005, p. 303. ↑ Guralnick 2005, p. 102. ↑ Guralnick 2005, pp. 412, 499–500. ↑ Guralnick 2005, pp. 217, 229, 381, 389. ↑ "Sam Cooke". rockhall.com. Retrieved 2008-08-08. ↑ "Sam Cooke Biography". Songwriters Hall of Fame. 2015. Archived from the original on February 20, 2012. Retrieved February 21, 2015. ↑ "Sam Cooke | Hollywood Walk of Fame". www.walkoffame.com. Retrieved June 12, 2016. ↑ "Walk of Fame (1994)". Retrieved June 12, 2016. ↑ "Sam Cooke". Los Angeles Times. Retrieved June 12, 2016. ↑ "The Immortals: The First Fifty". Rolling Stone (Issue 946). April 15, 2004. ↑ Art Garfunkel (December 2, 2010). "100 Greatest Artists: 16. Sam Cooke". Rolling Stone. ↑ "100 Greatest Singers of All Time". Rolling Stone (Issue 1066). November 27, 2008. ↑ "Chicago Honors Sam Cooke With His Own Street". News One. June 20, 2011. Retrieved February 10, 2012. ↑ Nash, JD (2015-01-20). "This Week in Blues Past: Janis Joplin, sam Cooke, BB King's Record Collection - American Blues Scene". American Blues Scene. Retrieved 2017-10-10. ↑ "Clarksdale beats Memphis and Detroit for R&B Music Hall of Fame Museum". WREG.com. 2014-11-05. Retrieved 2017-10-10. ↑ Keyes, Allison (2017). ""In This Quiet Space for Contemplation, a Fountain Rains Down Calming Waters"". Smithsonian Magazine. Retrieved March 10, 2018.